NEW YORK (Reuters) - New York's legendary punk-rock music venue CBGB's may be on its way back: in a new location with new music. New club investors are currently pursuing a permanent downtown Manhattan venue for the club that shuttered its doors in 2006, according to a club spokesman, who emphasized the managers of new venue will not be trying to emulate the past. "They are hoping to open a new venue focused on new music," the spokesman said. 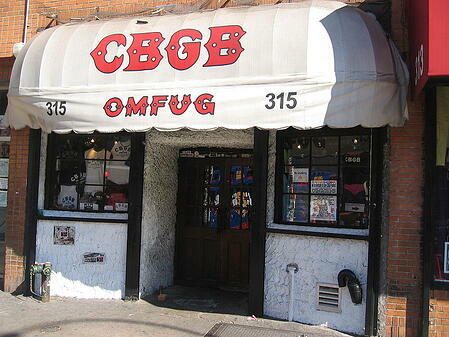 "They are not trying to recreate the past but hope to open a space in the spirit of CBGB." In addition, the first CBGB music festival will take place over four days from July 5-8 and showcase 300 indie bands at dozens of venues in Manhattan and Brooklyn, as well as film screenings and panel discussions. The club that existed on the border of Manhattan's East Village: its full name is CBGB & OMFUG, or Country Bluegrass Blues and Other Music For Uplifting Gormandizers: became the epicenter of the punk-rock scene in the 1970s launching bands like the Ramones, Talking Heads, Television and Blondie. The club has been a 'must play' venue for indie bands until it closed in 2006. The closing down of the club after a rental dispute signaled the end of an era and the gentrification of The Bowery area that now houses luxury apartment buildings with modern glass facades. The club's founder, Hilly Kristal, died in 2007, and since then CBGB's was dismantled and only existed to sell club merchandise. The club's estate, with Kristal's daughter Lisa Kristal Burgman as its co-executor, recently sold the rights to the club's assets to a new group of investors who are currently pursuing the new venue and have planned the annual festival, according to the club spokesman. "It's a relief to know that it's not going to die," Burgman told the New York Times, who first reported the story and said there was six investors behind the new venture. "It's going to be reborn." After Kristal's death the club became weighed down in legal disputes over the assets, and Burgman emerged from a legal battle as the co-executor of the estate. A spokesman for the club did not comment on what the assets sold for. The group of investors purchased the rights to the club's global intellectual property and physical assets. Kristal founded the club in 1973. Despite its name, the club became a breeding ground for punk and new wave music such as The Jam, The Cramps and Nico, among others.